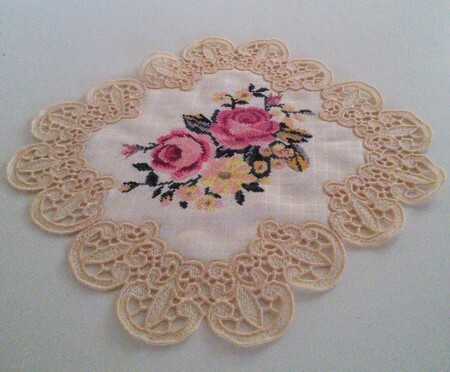 The Rose Bouquet design, used for this doily, is not a part of the set. You can find the Rose Bouquet here. Design for mega hoop is available only in DST, EXP, HUS, PES and VP3 formats! This set of machine embroidery designs is part of our Freestanding Lace Doilies collection. It uses the Freestanding Lace technique. The designs is available for the Large hoop (5" x 7") and Mega hoop (6" x 10"). This work belongs to Noeleen Wells from Australia. You can read about her project on the customer's page.